This was my Assignment project for the Physics and AI Module in my second year. The aim was to make apply physics and artificial intelligence to a 2D style game engine, implementing elements such as particle body motion, gravity, collision, particles, as well as attempt AI elements such as tracking and agent bodies. While we were taught the module using GDI+, the assignment had no specific requirements on the graphical libraries we had to use, as long as it was using C++ and the assignment used no pre-built physics/AI libraries. Because of this, most students used SFML, however I chose to use the Allegro framework due to my previous intrigue into the 2D C++ game framework. 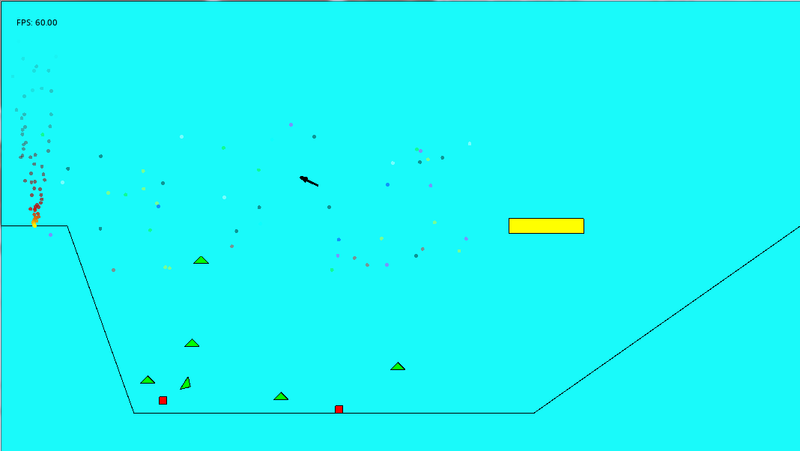 With the software, I attempted to show much of the physics elements that were required, including multiple forms of particle body motion (constant motion, constant acceleration, projectile motion, motion on an inclined plan ect), collision detection and reaction (which was all lined based) and particle systems. The Particle System I programmed is the thing I am most proud of with this assignment, as particle effects are my most favourite aspect of computer graphics. While I’m not proud of the collision reaction system, I think of this as a good effort of my first attempt at a physics engine.